Buddhist texts can be categorized in a number of ways. The Western terms "scripture" and "canonical" are applied to Buddhism in inconsistent ways by Western scholars: for example, one authority refers to "scriptures and other canonical texts", while another says that scriptures can be categorized into canonical, commentarial and pseudo-canonical. Another division is that between buddhavacana "word of the Buddha," many of which are known as "Sutras," and other texts. These religious texts were written in many different languages and scripts but memorizing and reciting the texts were of high value. Even after the development of printing, Buddhists preferred to keep to their original practices with these texts. According to Donald Lopez, criteria for determining what should be considered buddhavacana were developed at an early stage, and that the early formulations do not suggest that Dharma is limited to what was spoken by the historical Buddha. The Mahāsāṃghika and the Mūlasarvāstivāda considered both the Buddha's discourses, and of his disciples, to be buddhavacana. A number of different beings such as buddhas, disciples of the buddha, ṛṣis, and devas were considered capable to transmitting buddhavacana. The content of such a discourse was then to be collated with the sūtras, compared with the Vinaya, and evaluated against the nature of the Dharma. These texts may then be certified as true buddhavacana by a buddha, a saṃgha, a small group of elders, or one knowledgeable elder. In Theravada Buddhism, the standard collection of buddhavacana is the Pali Canon. The earliest Buddhist texts were passed down orally in Middle Indo-Aryan languages called Prakrits, including Gāndhārī language, the early Magadhan language and Pali. The Pali canon was preserved in Sri Lanka and the Theravadan Pali textual tradition developed from that region. After the rise of the Kushans, Sanskrit was also widely used. Sanskrit Buddhist literature later became the dominant tradition in India until the decline of Buddhism in India. Many of the Mahayana sutras were written in Sanskrit and then translated into the Tibetan and Chinese Buddhist canons (the Kangyur and the Taishō Tripiṭaka respectively) which then developed their own textual histories. The Mahayana sutras are traditionally considered by Mahayanists to be the word of the Buddha, but transmitted either in secret, via lineages of supernatural beings (such as the nagas), or revealed directly from other Buddhas or bodhisattvas. 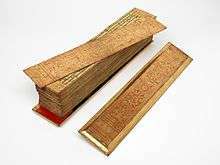 Some 600 Mahayana Sutras have survived in Sanskrit, or in Chinese and/or Tibetan translation. Some Buddhist texts evolved to become a virtual canon in themselves, and are referred to as vaipulya or extensive sutras. Scholars think, for instance, that the Golden Light Sutra constellated around the celebrated third chapter. 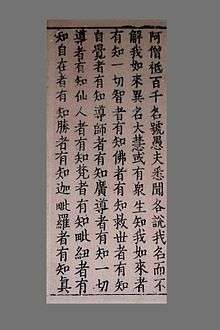 The Flower Garland Sutra is another example of a single sutra made up of other sutras, many of which, particularly the Gandavyuha Sutra still circulate as separate texts. The Flower Garland Sutra and the White Lotus Sutra are associated with the idea of the Ekayana or "One Vehicle". The texts claim to unify all the teachings that have come before into a greater whole. Recently an important archaeological discovery was made, consisting of the earliest known Buddhist manuscripts, recovered from the ancient civilization of Gandhara in north central Pakistan (near Taxila just south west of the capital Islamabad). These fragments, written on birch bark, are dated to the 1st century and have been compared to the Dead Sea scrolls in importance. Donated to the British Library in 1994, they are now being studied in a joint project at the University of Washington. Other texts have been important from very early in Buddhism. Extensive commentaries exist in Pali for the Pali Canon and in Tibetan, Chinese, Korean and other East Asian languages. The treatise Awakening of Faith in the Mahayana (attributed by the faithful to Aśvaghoşa) strongly influenced east Asian Mahayana doctrine and inspired numerous commentaries authored by early Korean and Chinese Buddhist teachers. Shantideva's Bodhicaryavatara has been influential in both Mahayana and Vajrayana (Tantric) Buddhism, and his Shiksha-samuccaya contains references to texts that no longer exist in other forms. The Platform Sutra attributed to Huineng is on the borders of Buddhavacana; it is one of a very few texts not thought to be spoken by the Buddha that has the label "sutra." One should note, however, that this distinction may be an artifact of translation; in the original Chinese, the Platform Sutra is a jīng (經), a term that may be translated as "sutra", but is also applied to a variety of other classic texts, such as the Daodejing and the Shi Jing. In the Platform Sutra, Huineng gives an autobiographical account of his succession as Ch'an Patriarch, as well as teachings about Ch'an theory and practice. The Zen and Ch'an school in particular rely on non-canonical accounts of Ch'an masters' lives and teachings, for example the Blue Cliff Record. Other types of texts that have been important are the histories of Buddhism in Sri Lanka, the Dipavamsa and Mahavamsa. The Pali literature has been divided by one scholar into roughly three periods. The early, or classical, period begins with the Pali Canon itself and ends with the Milindha-pañha about two thousand years ago. After a period of comparative disuse or decline, Pali underwent a renaissance in the 4th or 5th century with the help of Buddhaghosa, and this period lasted until the 12th century. The third period coincides with major political changes in Burma and lasted for some time in Sri Lanka, and much longer in Burma. See also Pali literature. The other (parts of) extant versions of the Tripitakas of early schools include the agamas, which includes texts by the Sarvastivada and the Dharmaguptaka. Parts of what is likely to be the canon of the Dharmaguptaka can be found amongst the Gandharan Buddhist Texts. 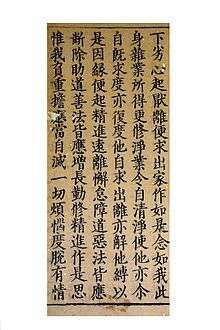 Several early versions of the Vinaya Pitaka (from various schools) are also kept in the Chinese (Mahayana) Canon. The Pali texts have an extensive commentarial literature much of which is still untranslated. These are attributed to scholars working in Sri Lanka such as Buddhaghosa (5th century CE) and Dhammapala. There are also sub-commentaries or commentaries on the commentaries. Buddhaghosa was also the author of the Visuddhimagga, or Path of Purification, which is a manual of doctrine and practice according to the Mahavihara tradition of Sri Lanka and according to Nanamoli Bhikkhu is regarded as "the principal non-canonical authority of the Theravada." A similar albeit shorter work is the Vimuttimagga. These sutras primarily teach the doctrine of vijnapti-matra or 'representation-only', associated with the Yogacara school. The Sandhinirmocana Sutra (c 2nd Century CE) is the earliest surviving sutra in this class (and according to some Gelugpa authorities the only one). This sutra divides the teachings of the Buddha into three classes, which it calls the "Three Turnings of the Wheel of the Dharma." To the first turning, it ascribes the Agamas of the Shravakas, to the second turning the lower Mahayana sutras including the Prajna-paramita Sutras, and finally sutras like itself are deemed to comprise the third turning. Moreover, the first two turnings are considered, in this system of classification, to be provisional while the third group is said to present the final truth without a need for further explication (nitartha). The Awakening of Faith in the Mahayana attributed to Ashvaghosha was influential in East Asian Buddhism, especially the Hua-yen school of China, and its Japanese equivalent, Kegon. Ashvaghosha is also celebrated for his plays. The Tibetan Kangyur includes a number of Nikaya-related texts from the Mula-Sarvastivada school, as well as Mahayana sutras. However, it is the specifically Vajrayana texts that most strongly characterise it. They are considered to be the word of the Buddha (Buddhavacana), and the Tibetan Kangyur contains translations of almost 500 tantras. The texts are typically concerned with elaborate rituals and meditations. ↑ "It is therefore possible that much of what is found in the Sutta Pitaka is earlier than c. 250 BCE, perhaps even more than 100 years older than this. If some of the material is so old, it might be possible to establish what texts go back to the beginning of Buddhism and may include the substance of the Buddha's teaching, and in some cases, maybe even his words." Alexander Wynne, 2003, p.22 How old is the Suttapitaka? ↑ "The University of Washington Early Buddhist Manuscripts Project". www.ebmp.org. Retrieved 13 April 2008. ↑ Edward Craig. "Routledge encyclopedia of philosophy". Awakening of Faith in the Mahayana Korean. Retrieved 6 July 2011. ↑ The Path of Purification (Visuddhimagga) by Bhadantācariya Buddhaghosa. Translated from the Pali. First edition 1956. 3rd ed. 1991. ↑ Woodward, F.L. Manual of a mystic, Being a Translation from the Pali and Sinhalese Work Entitled The Yogāvachara's Manual.